Attention conservation notice: Google-food for a gadget you will probably never need to know about. About two years ago, I bought an Acer 1830T as a cheap second laptop to throw in my bag (alongside my work-issued Macbook Pro; I segregate work and personal computing fairly rigorously when I'm employed). Some people say you can't get a decent laptop for much less than $1,000, and indeed many cheap laptops are terrible. However, I found that I used this dinky little plastic laptop almost as much as the Macbook Pro, and often enjoyed doing so. Even now, having quit my job and bought a workstation-class laptop for personal hacking, I still reach for the 1830T pretty often because it's tiny and light. I'm also planning a 9-week multi-country international trip in the near future. Losing my big expensive workstation laptop would be hugely painful. Losing the 1830T would be an annoying but tolerable inconvenience. Guess which laptop I'll be toting around the globe to hostels and sundry. On the other hand, even after all this time, the keyboard and touchpad still feel a little awkward compared to other keyboards and pointing devices I use. Overall, I'm happy with the return on investment for this machine. However, if I were looking for a new machine to fill a similar role today, I would probably spend slightly more and get an Thinkpad X131e (Intel version), mostly due to Lenovo's superior ergonomics. Recently, I dropped this laptop on a hardwood floor while the disk was churning vigorously on a vagrant suspend. The disk was destroyed. I back up everything that matters, to a mixture of external disks and remote git repositories, so the permanent data loss was minimal. Still, the laptop needed a new hard drive. SSDs have gotten amazingly cheap. I got the 120GB Samsung 840, which currently retails for $100. Granted, spinning-platter hard drives are even cheaper — a 500GB 7200RPM 2.5" drive costs about $60 — but a 120GB SSD is silent, much more durable, much faster, and large enough for everything I'm going to do with this laptop. So I bought the SSD. A younger version of myself would have installed Linux next, and called it a day. I decided to try to get Acer's Windows 7 image running on it again instead. In hindsight, I can't fully justify this decision, except with reference to vague worries about whether suspend and the HDMI output would work well. Regardless, if you're reading this, I imagine you might want to reinstall Windows too, so I'll go into some detail about the process. 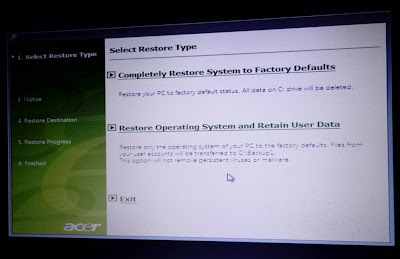 Now, by default, Acer expects the hard disk to be configured with a recovery partition, so that the system can be restored directly from the hard disk ("D2D recovery") in case of OS corruption. I think this is a waste of time and space, particularly since I ordered recovery CDs anyway (see below). However, if you want to try to set up a recovery partition prior to installing the OS, then feel free to wade through threads like this for help. The instructions below won't bother. Order Acer eRecovery discs for my machine's serial number, and wait for them to arrive. It took 3 days in total, from the day I ordered online until the day I received the discs by expedited FedEx, and cost about $38 including shipping. The package I received contained 4 discs: "System Disc (1 of 1)", "Recover Disc (1 of 2)", "Recovery Disc (2 of 2)", and "Language Disc". Open up the laptop's bottom panel with a small cross-head screwdriver. The RAM, wireless card, and hard drive are all easily accessible. It is trivial to remove the old hard drive and swap in a replacement, as the image below shows. It's a refreshing throwback to see a machine made this way. This style of design seems to be on its way out, at least in consumer markets, as people prefer sleek and hermetically sealed to slightly chunky and upgradeable. Connect an external USB CD-ROM drive and insert the disc labeled "System Disc". Turn on the machine. During the boot screen, press F2 to enter BIOS setup. In the "Main" section, find the option labeled "D2D Recovery" and toggle it to "Disabled". Press F10 to save and exit. During the reboot, quickly press F12 to bring up the boot order menu. 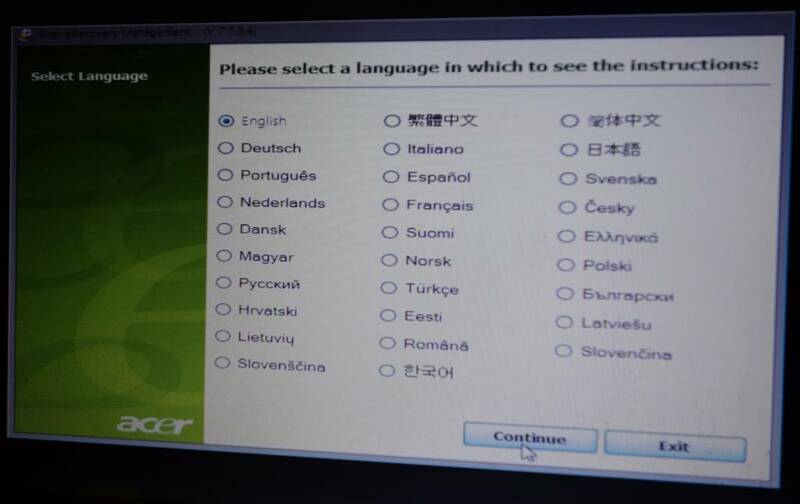 Select the CD-ROM drive and press Enter. 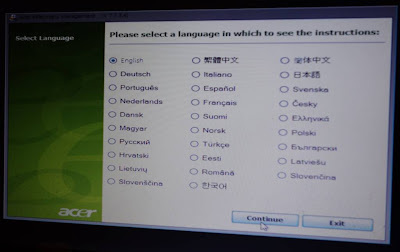 At the first menu screen, select a language. At the second menu screen, select the option to "Completely Restore System to Factory Defaults". Hard reboot by holding down the power button until the machine turns off. Turn on the computer. Once again, at the boot screen, press F12 and boot from the CD-ROM. At the first menu screen, select the option to "Restore Operating System and Retain User Data". There will be no user data to back up, but this is harmless. It appears that in this recovery code path, the defect which requests "System Disc 2" is not triggered. Eventually, recovery will complete and the system will boot into Windows. From then on, it was merely the usual routine of repeatedly running Windows Update until fixpoint, uninstalling crapware, and installing the considerable complement of additional software needed to make Windows a tolerable development environment. This probably sounds like a huge hassle, and it was, particularly the "insert System Disc 2" problem. Ultimately, though, I resurrected a broken laptop for about $138, and I expect this laptop to last at least another year, so I suppose it was worth the trouble. Attention conservation notice and disclaimer: Long, exhaustingly detailed post on the author's recent travels, with notes on gear (photographic and non-), parks, and a few restaurants. Also, many Amazon affiliate links, which are based on my honest appraisal of the referenced product and embedded herein with the sole motive of improving your life, but which you should treat with due skepticism. We drove in a ragged counterclockwise loop, starting from San Francisco and touching every state in the western U.S. except Washington. For illustration, the following map includes connective lines, drawn as the crow flies, although of course roads are not nearly as direct as the neat polygon traced thereby. All told, we took thirteen days. This was not ideal. A month or two on this route would give each area its proper due. For example, Yellowstone National Park alone could consume the better part of a week without wearing thin; we spent just one full day there. Nevertheless, although my travel partner A. and I both quit our jobs in the past year to make time for extended travel (among other things), we both had other plans that made it impossible to extend this particular road trip longer. To cover all this ground, our itinerary included a half-dozen 8-hour driving days, and several more 6-hour driving days. I normally hate driving. The scenery and sparse traffic on many routes made this road trip much more tolerable, per unit time, than, say, a commute to Mountain View on 101. Still, we were much happier on the days we drove less than 8 hours. On your road trip, I recommend scheduling all-day drives sparingly, with lighter days in between. Apart from the pace, the route itself was excellent, and I can recommend something resembling this loop to anyone considering a road trip through the West. The American West is a national treasure and everyone who lives in America should see a good deal of it in their lifetime. I had seen some of the West before — the Grand Canyon south rim, some of Phoenix and Las Vegas, ski resorts in Colorado and Utah, and of course much of western Washington State and California, where I've lived — but this trip was designed to be a fast ground-level survey of the West as a whole, especially those parts I hadn't seen. The vastness of the West is a cliché, but driving through it gives you an emotional connection to that vastness. You experience the space as both liberating and oppressive. The liberating part is perhaps obvious, the oppressive perhaps less so. In short, distance is a hardship. As you stare for hours on end at one road after another, cutting laser-straight up to the horizon, it gradually grinds you down. You can imagine people in centuries past, with vehicles much less convenient and rapid than a modern automobile, trying to traffic in emotional or material commerce with their neighbors or far-flung relations, and being perpetually taxed, and often thwarted, by the physical reality of the West's gigantism. Notwithstanding the difficulties that distance imposes on human beings, the West remains sublimely beautiful. The Southwest is literally rainbow-colored: red and orange earth and stone mesas which turn purple in the sunset, yellow and green grass and shrubs, slate-gray rocks colored blue by reflected daytime skylight. Every color is represented, albeit with a sun-bleached desert cast. The landscape gradually grows verdant as you climb up into the mountain prairies of Colorado and Wyoming, until you're surrounded by green. I had always ignorantly viewed Wyoming as one endless mountainous forest. In fact, much of the state consists of rolling green pastureland, dotted with black cows. Spread out beneath the clear blue sky, it seems like an unsubtle advertisement's depiction of heaven. Bliss was taken in Northern California, but it would be a fair representation of eastern Wyoming in mid-June (better, in fact, than of Sonoma County, where the hillside would typically be covered with vinerows, not grass). And all throughout, the land is a dynamic thing, stirred by the diverse energies of the Earth and the things living on it. I remember a long wind-whipped road in an Arizona valley where one sun-fringed tumbleweed after another blew across our path as we drove. Or driving through a nighttime thunderstorm towards Santa Fe, with purple lightning lancing the black horizon every minute. There are hundreds of images like these, and, memories being what they are, I probably won't even be able to hold them all in my head long enough to digest them completely before they evaporate. After Wyoming, we cut, finally, across the prairies of Idaho and eastern Oregon, towards Portland, and made our way down the coast back to San Francisco. This segment was more familiar to us, but redwood trees and sparkling oceans never lose their charm. One of the things that happens when you see enough of this beautiful land is that you slowly grow to love it. You love it enough that you become convinced that some of it must be preserved for all the people who might live, and thus love it equally well, in the future. The love makes you resistant to totalizing ideologies which say that it would be more efficient, somehow or other, to cut every corner up into parcels to be sold and utilized for the enrichment of individual people alive today. Love makes this scheme sound like selling the bits and pieces of your child's body to investors so that they might profit from dismembering it. Sure, some of the land should be in private hands. Most of it is, and that's fine. But you also appreciate the vision of people who set aside large tracts of the most remarkable land for public purposes, in consideration of those future people whose interests cannot possibly be accounted adequately by today's markets. This logic leads one to broader implications that are troubling to certain strains of belief, and it is not surprising that many libertarians find national parks so vexing that they resort to absurdities and cherry-picked examples ("Wolves in Yellowstone! Never mind that they've already been reintroduced and that private sector ranchers are far less wolf-friendly than the NPS!") to undermine the staggeringly persuasive moral and practical case for national parks. As noted, I take photos mostly to preserve things for my own memories. As a result, these albums are less carefully culled than a proper photo essay ought to be. I expect any rational viewer will get tired after a couple dozen pictures. Regardless, for completeness' sake, here are the albums. A GSM Galaxy Nexus cameraphone (a gift from my last employer). The T2i and lenses aren't the highest-end gear — gear hounds would call them "entry-level" — but I've been very happy with the versatility of this combination, and the total cost is less than a 5D Mark II body with a single zoom from Canon's "pro" L series. ...and swapping lenses on a single body in the field is agonizingly slow with a moving subject or changing light. Now, I don't want to carry a second DSLR body for my vacations. That's a Rubicon of photo geekery that even I am not yet ready to cross. So my current solution is to carry the RX100 in my pocket and the T2i around my neck, with either the wide-angle or telephoto lens on the latter, depending on what I expect to be shooting (wildlife, for example, demands telephoto). With this setup, I use the T2i when I need a specialized lens, and can quickly pull out the RX100 for mid-focal-length shots. Thus, although the midrange EF-S 17-55 is the best lens I own (and it's a great lens, very versatile and sharp), it's become one of my less-used pieces of kit. I can't say anything about the RX100 that photo review sites have not, but I'll add my voice to the chorus: it's an amazing compact camera, qualitatively better than any other compact camera I've ever used. Low light performance is especially impressive, but pretty much everything else is terrific too. And the RX100's panorama and HDR modes are surprisingly useful. I found myself reaching for the RX100 to use these modes, sometimes, even when I had a T2i lens mounted that would have worked. HDR has a mixed reputation among photo snobs, because it can easily be misused to produce cartoonishly oversaturated garbage (and I admit even the example above looks a little cartoonish, although that's how it looked when I was there!). But some compositions, in some lighting situations, simply have inherently high dynamic range. When HDR is used solely to compress shadow and highlight detail back into the image's usable range, it produces vivid, naturalistic images that are much closer to your subjective experience of the scene than a "normal" digital capture. I used the Galaxy Nexus mostly for photospheres. This feature alone should make a post-4.2 (Jellybean) Android device the cameraphone of choice for photographers. You won't take photospheres often — it's fairly time-consuming — but sometimes a location calls out for one. When the stitching (which can be finicky) works out, you get stunning results that can't be duplicated with any other type of camera. When Samsung first started releasing compact cameras that ran Android, I scratched my head a little. Now I wish my RX100 ran Android, so that it could make photospheres. One final piece of photo gear that I carry and recommend: a Sun Sniper shoulder strap. It's so much more comfortable than the stock Canon neck strap, which traps sweat, irritates your skin, and holds the camera in a maximally annoying spot against your chest or ribs. It's like the difference between hiking in flip flops versus proper hiking boots. Get one; your physical comfort will be immensely improved. I'd flown into Las Vegas before, but I can say that driving into it is a qualitatively different experience. You really sense how absurdly this city popped up in the middle of nowhere when you've been driving through the desert for hundreds of miles. And it's not an unpleasant realization: why shouldn't humankind make something utterly ridiculous and festive here? There's plenty of non-ridiculous desert left over. Cirque du Soleil Mystère is one of Cirque's better shows. Certainly, their touring shows (I've seen Ovo and Totem) are more spectacular than their fixed-venue shows, but there are enough jaw-dropping feats in Mystère to make it worthwhile even if you've seen a few others. Be sure to use your favorite search engine to find discount tickets and/or coupons when making reservations. I'd been to Grand Canyon National Park before, but never the North Rim. My previous visit, to the South Rim, was decades ago, so my memories are fuzzy, but the North Rim seems far more verdant and less crowded than the South Rim, and just as spectacular. For various reasons, we only ended up camping one night of our trip. Car camping is easy and brings costs down a lot. If you can make camping work, it's definitely worth doing. Anyway, Goulding's Campground in Monument Valley is a relatively pricy campground (albeit still much cheaper than most motels), but it is also weirdly well-appointed, with many bathrooms, a gift shop, and even an indoor pool. Be advised that you can't drive tent spikes all the way into the ground (there's not enough of the dry, sandy dirt over the rock; possibly it's concrete under there? ), so you'll have to weight down your tent with luggage. Amazingly, Petrified Forest National Park is every bit the equal of the Grand Canyon in picturesque beauty. The vistas of the Painted Desert here are insane. The petrified wood, for which the park is named, is actually the lesser attraction here, although it's interesting enough. Meteor Crater is unique and visually impressive, but it feels like a tourist trap, and you don't get to hike all the way down into the crater. Go here with moderate expectations and you'll be satisfied, I guess. White Sands National Monument is visually surreal, like something out of a dream. You can rent sand sleds from the visitor center; they're only moderately entertaining, but it's super cheap and you might as well try it. Bring your best sunscreen and a wide-brimmed hat. Santa Fe is a very touristy town, but remains charming nevertheless. It's sort of a Carmel in the desert, but with more history: lots of little walkable streets and charming old architecture, lots of art galleries and other stuff catering to well-heeled visitors. Where Carmel has an Eyvind Earle gallery, Santa Fe has a Chuck Jones gallery (which is thoroughly enjoyable). Etc. The Georgia O'Keefe Museum was especially interesting after driving through the Southwest for several days; being immersed in the landscape alters the way you see O'Keefe's paintings of it. The Museum of New Mexico is also a well done presentation of the state's history, which is more interesting than you probably suspect, given that New Mexico's contribution to America's global cultural footprint today is rather modest (with perhaps one notable exception). Lastly, if you visit Santa Fe, get The Streets of Santa Fe: A Walking Tour from 1880 to the Present (available on Kindle), which is an astonishingly thorough catalog of Santa Fe local history. It must be a labor of love, because I've never seen a travel book that embodied a comparable, and irrationally exhaustive, amount of research focused on such a modest subject. Great Sand Dunes National Park is as surreal as White Sands, but in a different way: the dunes are simply unbelievably huge. The thin air at this altitude and the difficult footing on the dunes makes ascending them more tiring than you expect, but the reward is worth it. Mount Rushmore was impressive, but not very fun or charming. I'm glad I went, but I'd rate it my least-favorite park among those we visited on this trip. Yellowstone National Park: Really I can't add anything about this place that hasn't been said before. It's amazing. Go there, repeatedly. We passed through Boise, ID on the way back west, not expecting much, and were pleasantly surprised. It felt a bit like a smaller, less verdant Portland. I can easily imagine that lots of Pacific Northwest refugees, fleeing rising prices in Portland and Seattle, might be settling here happily. There's a large Basque population, and Epi's Basque Restaurant (Yelp) easily earns all its five-star reviews: the food is hearty homestyle fare, not haute-cuisine, but it's completely satisfying, and the service is the friendliest and most pleasant that I've ever encountered in a restaurant. Nobody who comes anywhere near southwestern Idaho should skip it. Portland, OR: you can read lots about Portland elsewhere, but I'll just add a couple of food notes: Voodoo Doughnuts is overrated (it's certainly good, but it's just huge piles of super-rich frosting slathered onto fairly ordinary doughnuts), whereas Screen Door lives up to its accolades (I'm not an expert in Southern food, but their fried chicken is exceptional, succulent and crisp and not overly greasy). After Portland, we drove down the coast and stayed overnight in Port Orford, OR. If you're ever in the area, don't miss Griff's On the Dock, which is located on a working fishing dock — you almost can't believe there's a restaurant down there until you round the corner onto the dock and see it — and has a tiny but charming maritime museum inside. Anyone who drives down the Northern California coast and does not detour through The Avenue of the Giants (Google Maps) to see the redwoods has no soul. Seriously, it's so easy and doesn't even add much time to your trip. Mendocino and Mendocino Headlands State Park were both places A. and I had visited together before. On clear, sunny days, I'm convinced that Mendocino is among the prettiest places on Earth. Certainly, many places surpass it by far in sublime beauty or visual dynamism or what have you, but few places manage to be prettier. Go if you can. While you're in the area, be sure to stop at Cowlick's Ice Cream Cafe in nearby Fort Bragg and try the mushroom ice cream. It's flavored with candy caps (Lactarius rubidus), a delicious regional ingredient that's challenging to obtain even in Northern California. Capsule reviews of the non-photographic hardware we used on our road trip follow. I'll admit we were somewhat comically overprepared, but you'll probably want some subset of this stuff on a long road trip. Toyota Corolla LE (2003): My car is 10 years old and had about 31,000 utterly trouble-free miles on it when we started (I don't drive that much). We added about 5,500 more miles, at a cost of about $550 in gas, give or take. I don't have much to say except that my trouble-free streak continued. Toyota made great cars in the early 2000's. USGS Interagency Annual Pass: No-brainer. Buy in advance and remember to put it in your car; it's easy to forget (I know from bitter experience) and there's no way to get it replaced once you're on the road. Collapsible cooler: You will get hot and thirsty driving across the American desert. Bring a cooler and refill it with ice every day. Swim goggles and swimsuits: The motel pool is your friend. After sitting cramped in a car seat for many hours as you blast through the hot dry desert, swimming a few laps serves to cool you off, relax you, and give all your muscles a workout. It is almost always worth paying a small premium for a motel with a pool. Google Maps + Android turn-by-turn navigation: My primary mode of trip planning was to have one huge browser window open with a map, alongside another browser window for making hotel reservations. I starred all my destinations (hotels, park visitor centers, etc.) in the the Google Maps web client; the starred locations would be synced transparently to my Android devices, making it easy to invoke navigation from the Android UI on our dash-mounted phone later when we were on the road. While planning, I would also compute driving routes in the Google Maps web UI, then generate a short URL and paste it into our shared Google Doc. We allegedly live in the "post-PC era", but when you're planning a road trip, the huge screen, fast text entry, and multitasking window manager of a desktop UI crushes today's tablet interfaces so utterly that it's embarrassing to compare the two. And nobody else's current maps offering is even remotely comparable to Google's for serious planning (Apple Maps, for example, doesn't even have a web UI). Rand McNally Road Atlas (print): I've had this in my car for years. Google Maps on Android has offline maps, but I think it's essential to have a paper map on hand as a backup. We were extremely well-provisioned with gadgets, but still there was one point where we had no cell coverage and wanted to look up a route we didn't have cached on Google Maps. Audible audiobook of 1491: New Revelations of the Americas Before Columbus: Audiobooks are tailor-made for people who spend long stretches of time in the car and I strongly recommend bringing a couple on any extended road trip. This book came highly recommended by T. Cowen, among others, and lives up to its reputation. If you've read Guns, Germs, and Steel then 1491 is in some ways a mandatory corrective, as it will considerably alter your perception of Diamond's ideas (without exactly invalidating them). It was especially enjoyable to listen to this book while driving around in the landscape where some of the history being described happened, albeit a small part (most of America's great indigenous civilizations were centered elsewhere). Audible Android app: Tolerable. It's sluggish, resource-hungry, and glitchy, but it gets the job done. We ran this mostly on a Nexus 7 paired to a Bluetooth-to-FM car audio adapter: my car, as noted above, is old, and it doesn't have an external audio input. The Flexgroove x2 is currently Wirecutter's pick for FM adapters and it performed exactly as advertised. It has a USB power pass-through port, which we usually hooked up to charge the phone we were using for navigation. Car power inverter: We often found ourselves wanting to charge more than one device in the car. The 2003 Corolla has a second power outlet hidden in the driver/passenger armrest compartment. We plugged a 75W power inverter with 3-prong and USB outputs into that outlet. It's a little bulky, but it fits, with enough room left in the compartment to stash a couple of charging devices. You can power your laptop from it as well. Overall this product was exceedingly handy. Note that higher-wattage inverters are available on the market, but many cars' power plugs are only rated for about 120W of load. The results of connecting higher-wattage devices to your car are questionable and might include tripping breakers in your electrical system. USB 4-port, 4 amp wall charger: Hotels just never have enough power outlets and laptop USB ports often don't put out enough amperage to charge devices quickly. This device solves that problem and also reduces the clutter in your bag. Be warned that I bought a Bolse branded charger (not the one linked here) and it died after about a week of heavy use on the road. So far the Skiva charger has held up, although I haven't loaded it as heavily. If you're going on a long trip, you should bring a backup charger in addition to this one. USB power pack: I bought an Anker 13000mAh power pack a few weeks ago as an Ingress accessory (more gear tips here), but it turned out to be pretty useful on this trip too (and not just because we played a little Ingress in Santa Fe, Portland, and West Yellowstone). iPad Mini AT&T (2013): I'm on T-Mobile; A. is on Verizon; I bought this at the last minute so that we'd have triple carrier coverage. I expected that the iPad Mini could function as a portable hotspot as well. In practice, there were almost no areas with AT&T coverage and without either T-Mobile or Verizon coverage. The most common situations were (a) no cell service, (b) Verizon and nothing else, and (c) all three providers had some signal. Additionally, the iPad functions abysmally as a portable hotspot. It takes a long time for devices to connect, and connections frequently stop working (but do not disconnect; you just get a spinning throbber). I observed this with multiple client devices, including devices running multiple Android flavors, Windows 7, and OS X. I was so frustrated with the iPad's performance that I returned it to the store immediately after I got back to San Francisco. If you want a portable hotspot, buy a dedicated portable hotspot: it's cheaper, and it might actually work. Finally, Apple Maps and Waze provided no additional benefit, compared to Google Maps alone, on this kind of long-haul road trip. Overall, I found the iPad Mini much less valuable than our Nexus 7. Portable stove: I have this Coleman propane grill/stove, which worked perfectly at the campsite but is frankly more hardware than we really needed. Knowing what I know now, I'd probably buy something smaller (and ideally cheaper), although I'd still choose a model with a built-in igniter. We also had a compact camping cookset (REI has other good choices), although for car camping it's obviously possible to pack a regular pot and plates instead. Ha ha! Like anyone's going to read this whole thing. One guy's thoughts on the pursuit of happiness. Pure linkblogging is currently outsourced to Pinboard. Sometimes I blow off steam on Twitter.